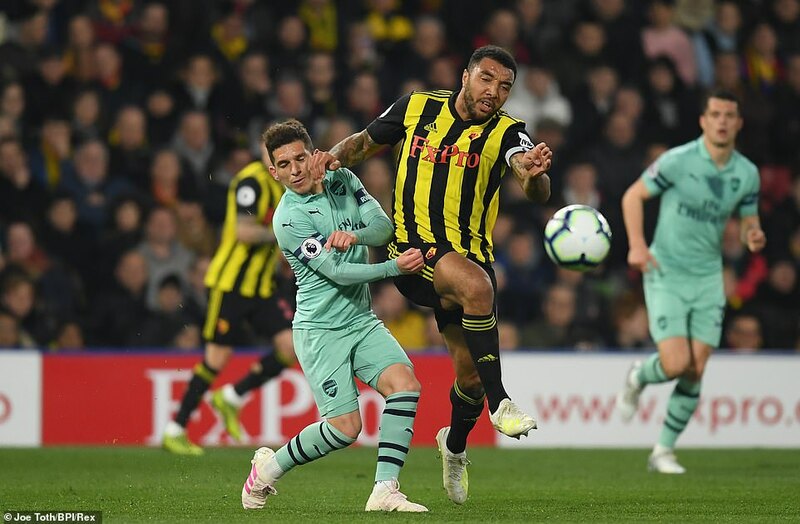 Deeney, the bulldozer who has single-handedly ignited a running feud with these opponents, might have imagined celebrating a thunderous penalty or a thumping header. Another chance to cut the pretentious down to size and remind the world why, in his estimable opinion, Arsenal lack ‘cojones’. Yet since he first made that claim on the back of a winning goal last season, matters have conspired against Deeney. He missed a penalty at the Emirates Stadium and here came further poetic justice. Deeney was indeed bare-chested by the 11th minute of this game but under circumstances nobody would have foreseen. 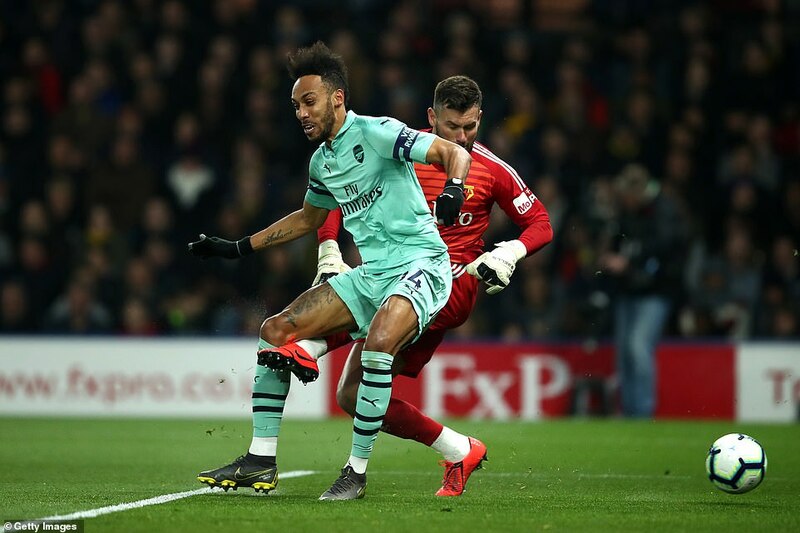 As his team trailed to a Pierre-Emerick Aubameyang goal scored one minute earlier, Deeney self-destructed and all but lost his side the contest. 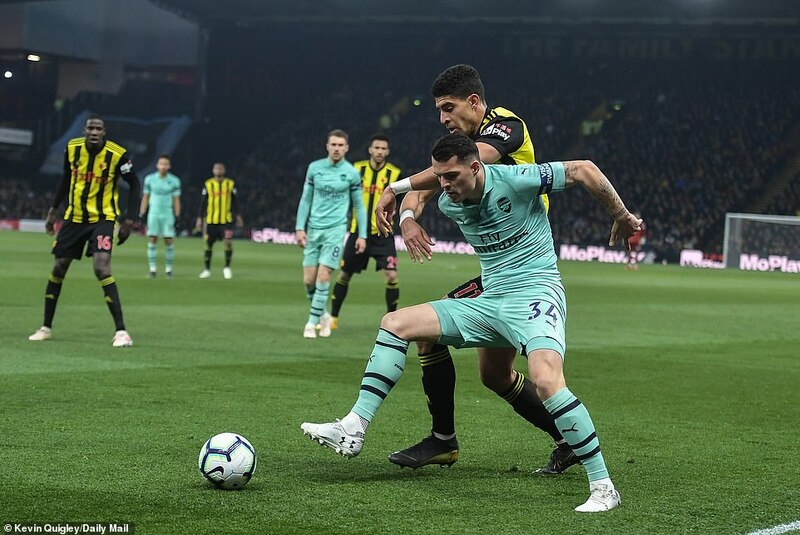 Arsenal were passing the ball across their midfield when Lucas Torreira moved the ball on. 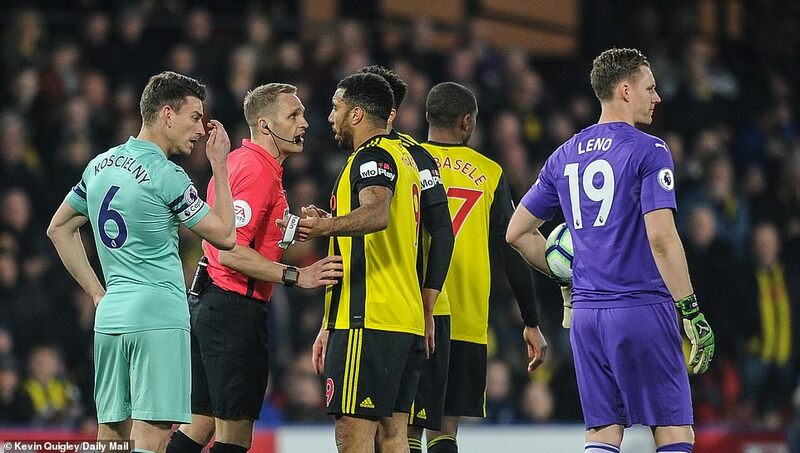 Deeney ran across his path, left a nasty elbow on the side of his head and referee Craig Pawson swiftly pulled out the red card. Deeney looked aghast and feigned innocence. Yet the replays were damning. 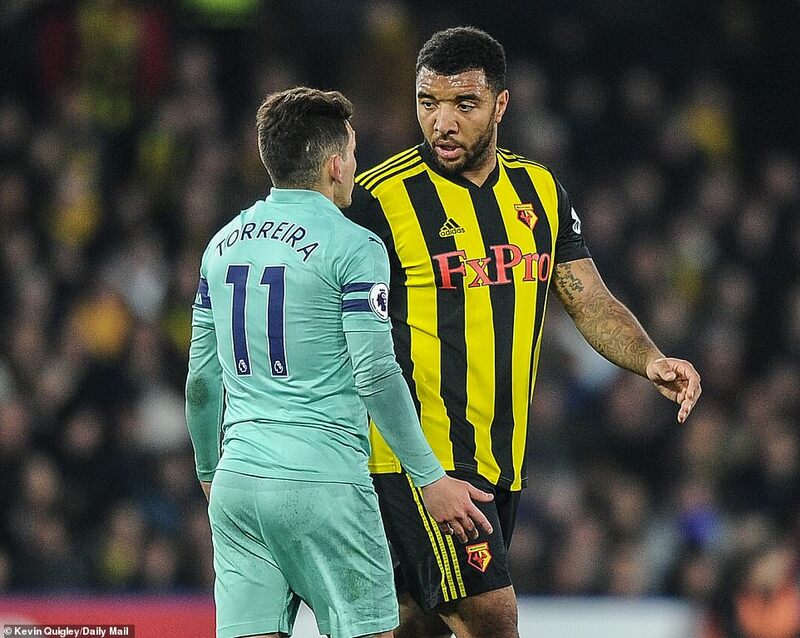 Deeney quizzed the official, discussed it with Arsenal players and then tore off his shirt and headed for the tunnel, exchanging words with visiting backroom staff in the process. By half-time, he was fully clothed and observing events from the tunnel. For Deeney and Watford, it was a shame after such a magnificent fightback in the FA Cup semi-final against Wolves last weekend. 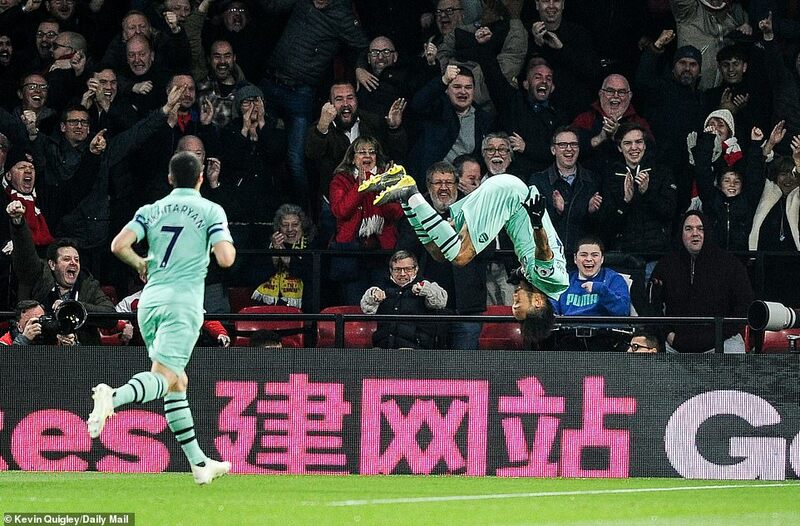 As for Arsenal, it was always likely to take something remarkable to alter their dreadful away form and even with the spare man, Unai Emery’s team were indebted to the post, the bar and their goalkeeper’s reactions as they returned to the top four. Indeed, Arsenal’s greatest inspiration on the night came from Watford’s two most experienced men. 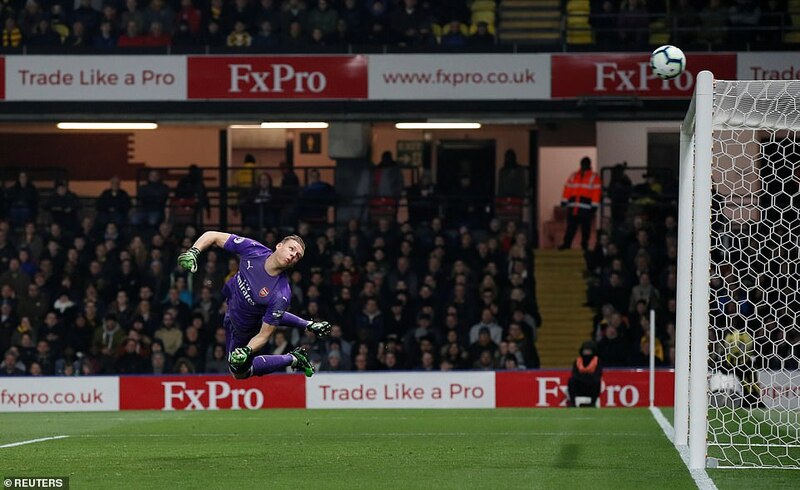 Much like Deeney, Ben Foster has enjoyed an outstanding season but he lapsed dramatically to gift Arsenal the lead. An Arsenal move fizzled out down the left side and Daryl Janmaat harmlessly sidefooted back to his goalkeeper. Foster could have swept the ball away first-time with his weaker foot but instead shifted it onto his left. 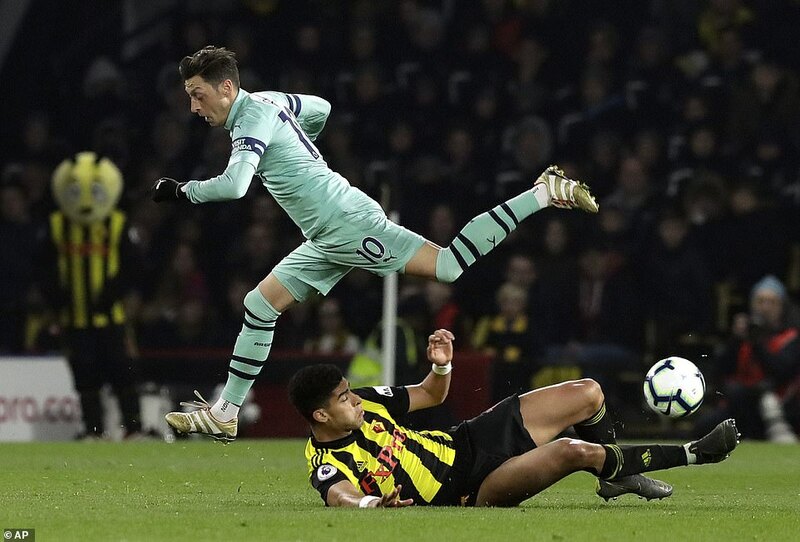 Yet his touch was heavy, clumsy, and invited a sprint by Pierre-Emerick Aubameyang. Foster got to the punch first but the striker was by now too close, rebounding the ball into the goal. It was a desperate moment for the Watford goalkeeper but all did not appear lost. Watford had actually started the brighter and Arsenal are hardly infallible visitors. After all, they had not kept a Premier League away clean sheet all season before this and have won only five top-flight games on the road – all against bottom half opponents. 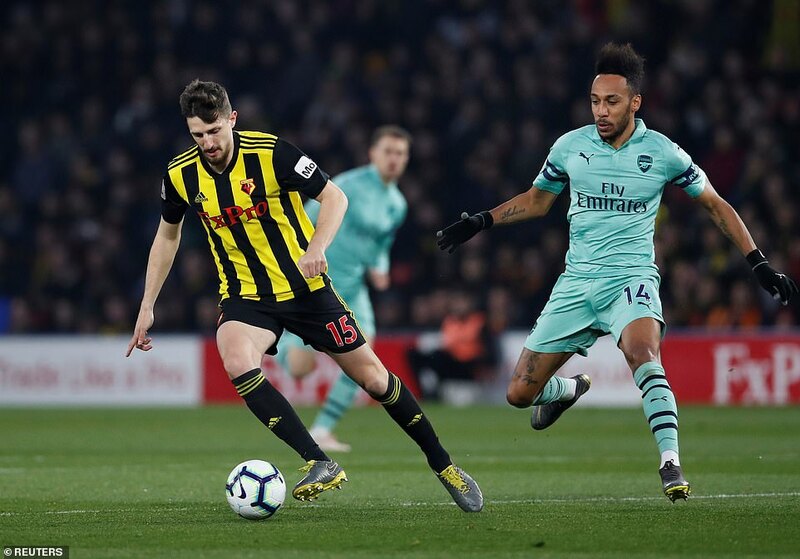 Indeed, Emery’s team selection offered further promise for Watford. 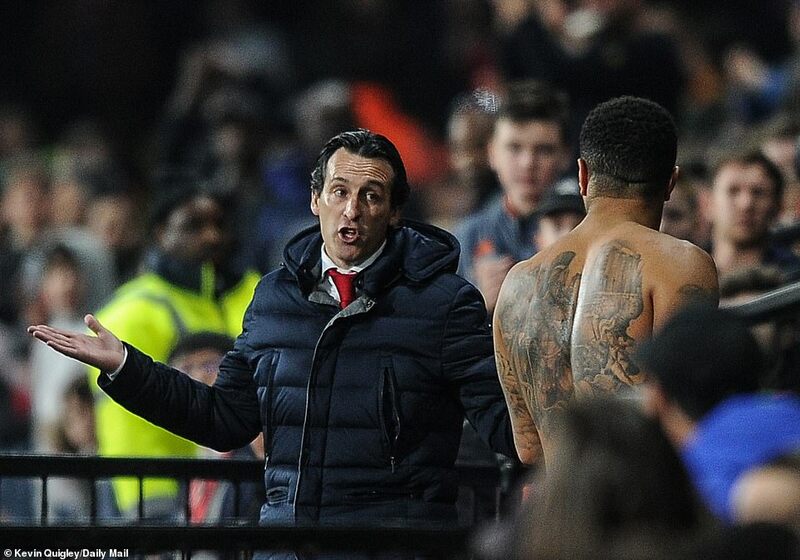 Sandwiched in between two Europa League ties against Napoli, Emery made changes. Konstantinos Mavropanos made his first start of the season in central defence and Shkodran Mustafi shifted to uncomfortable territory at right-back. At the heart of the Arsenal defence, the Greek made an uncertain start, missing a header altogether and then skewing out for a corner instead of a throw-in. Not too much to worry Watford, then, despite the early setback. Yet then Deeney’s reckless streak intervened and the task grew harder. Watford briefly lost their heads. Abdoulaye Doucoure went in high on Torreira and should have been cautioned and Janmaat ought to have followed too. Instead, referee Pawson showed restraint to both. To Watford’s credit, the one-man deficit did not show for much of the first-half. Instead, Gracia’s side actually created the best three openings, although Alex Iwobi did force one save from Foster. Arsenal tend to be ropey both defending set-pieces and against pace on the counter-attack. So it proved once more. When Granit Xhaka misjudged a header, Craig Cathcart’s instinctive strike cracked the post. Andre Gray then left Mavropanos for dead and his low cross was steered away by Nacho Monreal. Still Watford came. Etienne Capoue’s dipping free-kick sent Leno sprawling to his left to tip around the post. Emery sought greater control, introducing Mesut Ozil at the break and relieving Torreira. The German immediately brought composure and Arsenal became more menacing. 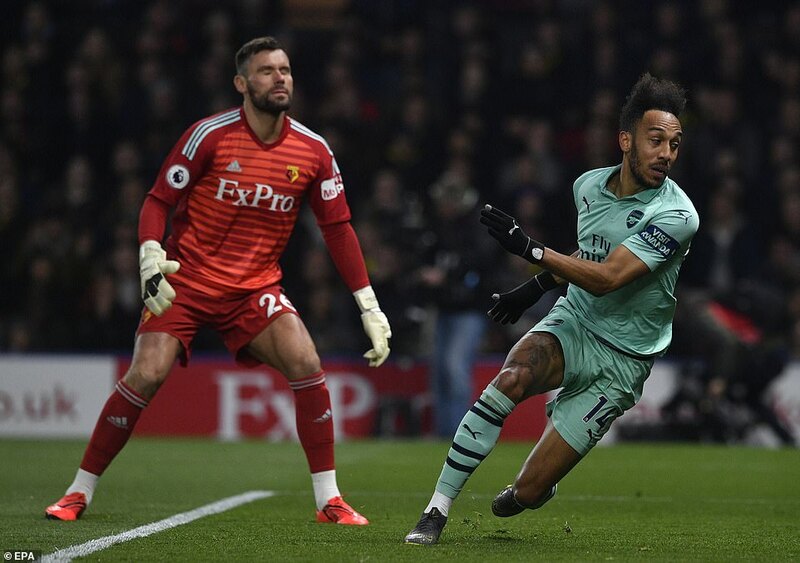 Iwobi’s clipped cross eluded Aubameyang but crept narrowly wide. 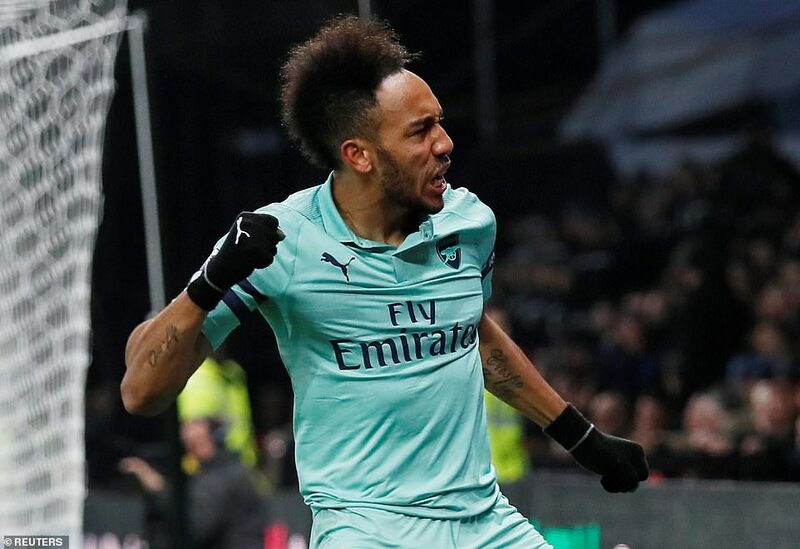 Iwobi then skated the length of the pitch on the counter-attack, dinking a perfect cross for Henrikh Mkhitaryan, who struck first time on the volley but was superbly denied by Foster. 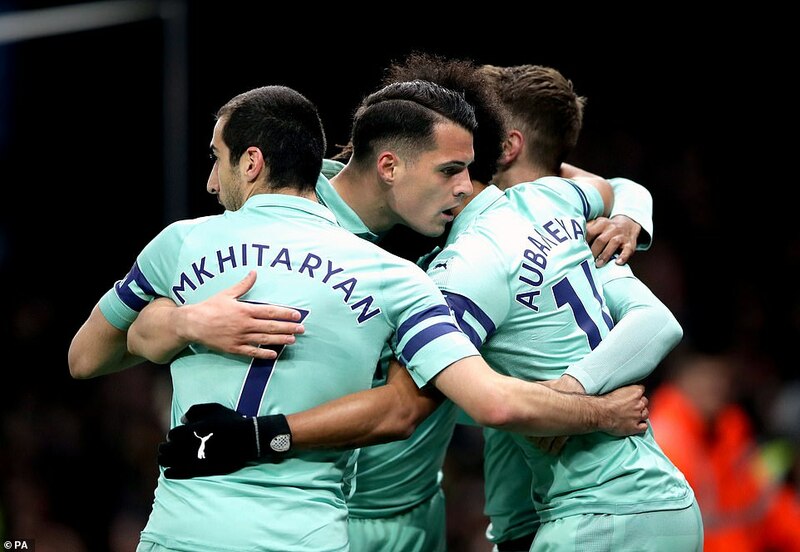 Emery intervened once more, hooking Mavropanos and altering his shape. Yet still they could not shake Watford off. Adam Masina arrowed a 30-yard strike against the bar and Andre Gray then miscontrolled when through on goal. 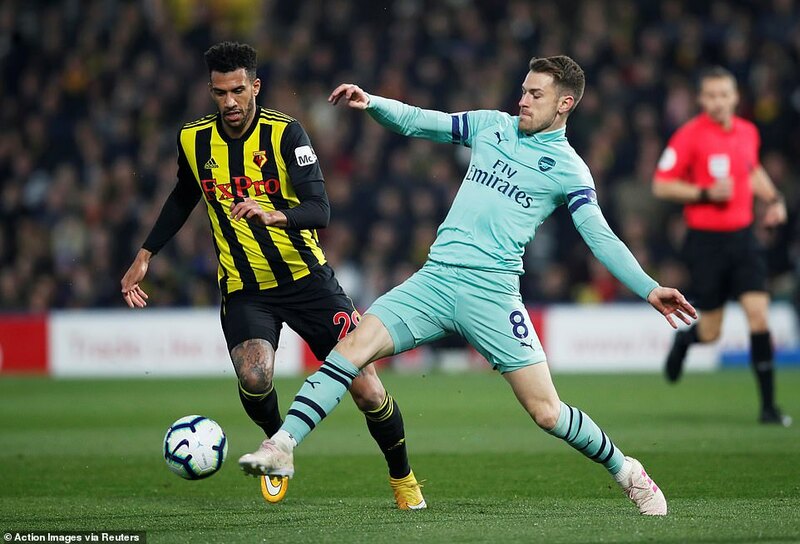 Arsenal grew edgy and the angst from the away end was amplified when supporters appeared to jeer the decision to replace Aaron Ramsey. The supporters were proved correct. Arsenal simply dropped deeper, ceding ground and yet more opportunities. Gray broke free in the penalty area, rounded Leno and only a magnificent saving challenge from Ainsley Maitland-Niles prevented an equaliser. 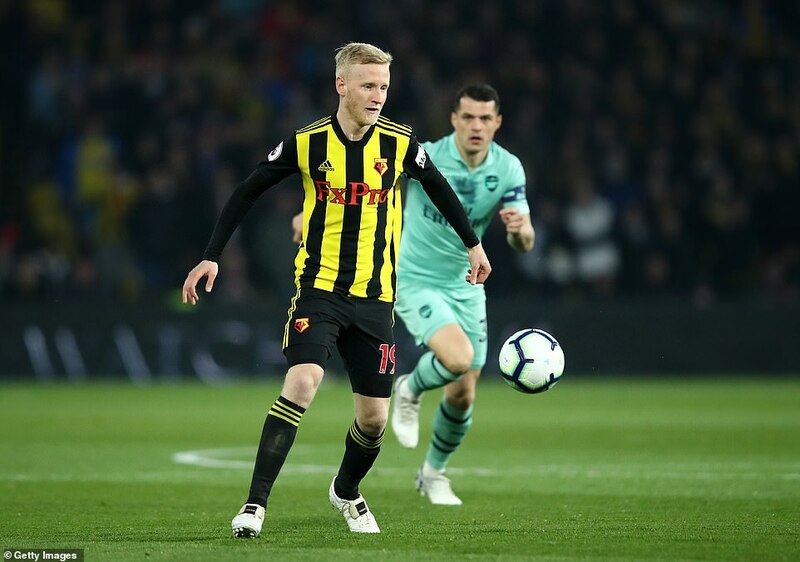 Watford came again, Will Hughes heading over at the far post. Arsenal sporadically threatened, with Guendouzi and Ozil both spurning promising breaks. Yet after Wembley heroics, there would be no Watford fightback this time.